The Lady Bulldog golf team picked up its second state leg in as many outings and its first tournament-winning trophy Thursday at the Ruidoso Great 8. It’s a trend they’d like to continue. 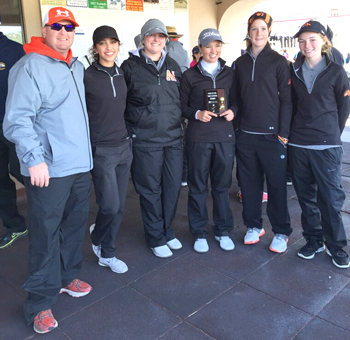 The Artesia girls bested their closest competition, Alamogordo, by 14 strokes on a cold, windy day on The Links at Sierra Blanca and added a pair of individual state legs, as well, with Josey Jackson notching her second and Brehnan Davis her first. The Bulldogs finished second as a team behind Socorro but didn’t quite have enough for a team leg. Caleb Morton’s round of 78, however, was good enough to tie for third in the tournament and join Chaz Matthews with one individual qualifying leg. Leading the way for the Lady ‘Dogs Thursday were Jackson – with a round of 81, which tied her for second – and Davis – with a third-place 85. Taysea Powell posted a 94, Teagan Archer a 98, and Sydni Salmon a 101 in the team 358 performance. All golf courses are a bit difficult to read while still shaking off their winter coats, and the greens at The Links are particularly so. “Especially with that being the case, the girls did fantastic,” said Bean. The ‘Dogs, meanwhile, didn’t quite pull down the scores they would have liked with a team 328 but still saw bright spots. Morton’s 78 was followed by Parker Sanders with an 82, Jake Craft and Wesley Davis with rounds of 84, and Matthews with an 86. “We didn’t play as well as we wanted to, but Caleb shot an individual qualifying leg and Parker had a really good round,” coach Paul Kirkwood said Saturday. “I was really proud of him. The Artesia High School golfers will now prepare to host their lone annual home outing Monday, this year with a twist. The Artesia Invitational Tournament name has been replaced by the Eddy County Challenge, as all teams involved will head from the Artesia Country Club to the Lake Carlsbad Golf Course Tuesday for a second round. Action begins at 9 a.m. Monday in Artesia. “Our goal for our tournament is to get our third team leg and get ourselves qualified for state,” said Bean. “Winning would be the cherry on top, of course, but that’s the main goal.